Dangerous legislation may be the greatest threat to religious freedom and rights of conscience in memory. The so-called “Fairness Act” – what is it? 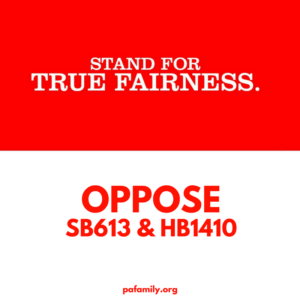 Take Action: Contact your State Senator & State Representative to oppose so-called “Fairness Act” – SB 613 and HB 1410. Photographer – Is it fair to make violating your beliefs the cost of citizenship? Florist – Is it fair to threaten a woman’s life savings for declining a friend’s business? Baker – Is it fair to fine a family $135,000 for refusing to violate their conscience? Cake Baker – Is it fair to compare a Christian to a Nazi just for living out his beliefs on marriage? Rental Property – Is it fair to compel Christians to do something that violates their faith? T-Shirt Designer – Is it fair for the government to compel someone to say something? Fire Chief – Is it fair to fire someone for their beliefs on marriage? Bathroom / Locker room facilities – Is is fair to force a school to open girls restrooms to male students? Faculty Hiring – Is it fair to make a Catholic school hire teachers that don’t follow Catholic teaching? Keep PA Fair: a three-page handout detailing the impact to religious freedom by this type of proposed legislation. Protecting Your Ministry: A legal guide for Churches, Christian Schools and Christian Ministries.